The ndial combines automated sampling and sequencing with manual controls to navigate sound worlds in unpredictable ways. The system selects samples at random from a live or prerecorded source and maps them to eight steps on the interface. The interface can match pulses, record live samples, reorganize patterns, add effects, and remix performances in real time. Recordings are explored out of order, and because control of the content is limited, preconceived strategies give way to the matters at hand. video of some basic operations — source material by momoko & villalobos. for more info, there's a manual (pdf). The ndial is designed for use with the onism software system. Four ndials were used in the performance-game-nterplay, Re. A typical nterplay lasts between 8-15 minutes with each ndial drawing from one sound world—a recording, song, speech or live input. nterplays can involve anywhere from 1 to 4 players. A new record is made for each ndial performance. The record serves as a map, helping to navigate between sound samples and worlds. 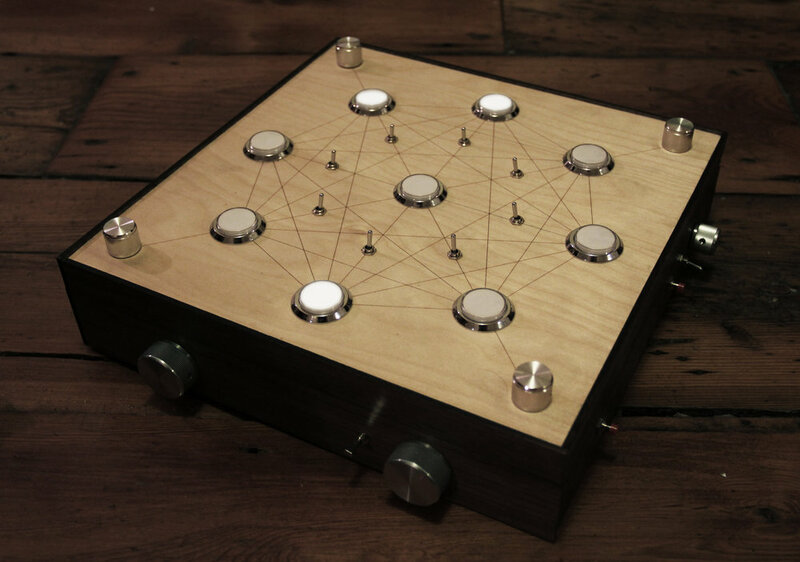 Each sound can be re-written with live sounds, but when shuffled, the ndial chooses samples from the active sound world. The player designs the record.